UK knocked out of Robot Soccer World Cup | UNBELIEVABLE! The UK’s strongest team of football-playing robots has been eliminated from the World Cup in the group stages. The competition is called Robocup, and is an annual event that has been growing in competitors and popularity since its inauguration in 1997. This year’s finals were held in Istanbul, Turkey. The UK team coach, Edinburgh University’s Dr Subramanian Ramamoorthy, attributed the team’s failure to software, strategy, and inexperience. However, he feels the team (called Edinferno, comprising four robots) had achieved its goals for the tournament, and will come back strong next year. “Almost all the bugs that stopped us were because we were not match ready. I suspect we are one of the few that are here for their first year. Until this year there was no British team, and we learned that our core technology is not that bad even though we have not been very successful,” he explained. All the robots competing at Robocup are autonomous – they play with their own software intelligence. They may seem a little slow and a little clumsy, but the ultimate long-term goal of Robocup is to produce robots that can defeat a team of human players. 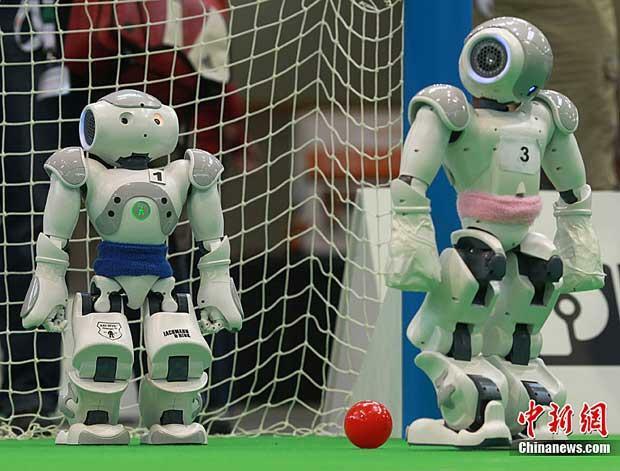 The target is to produce a robot team that will beat a human Fifa World Cup-winning team by the year 2050, and Dr Ramamoorthy believes this is achievable. “I think we could get there. We can make robots that can win that game as all the pieces are here … However, if we did get there, the result would not be just about football. If you had robots that could win that game they would be useful for so many other things,” he said. Above: video of the Robocup 2011 Adult Size Final. The final score was 1-0 to Virginia Tech’s robot named CHARLI. Posted on July 11, 2011, in Technology and tagged AI, Football, Robocup 2011, Robots, Soccer, Sport. Bookmark the permalink. Leave a comment.